The Open Beta for Update 3.3: Rise of Galactron is less than a week away! Starting July 20th you’ll be able to test out the completely new matchmaking system, including the new rejoin feature we detailed recently. One other important feature that we’ll add with this new update is the ability to enter into a persistent party with your friends! 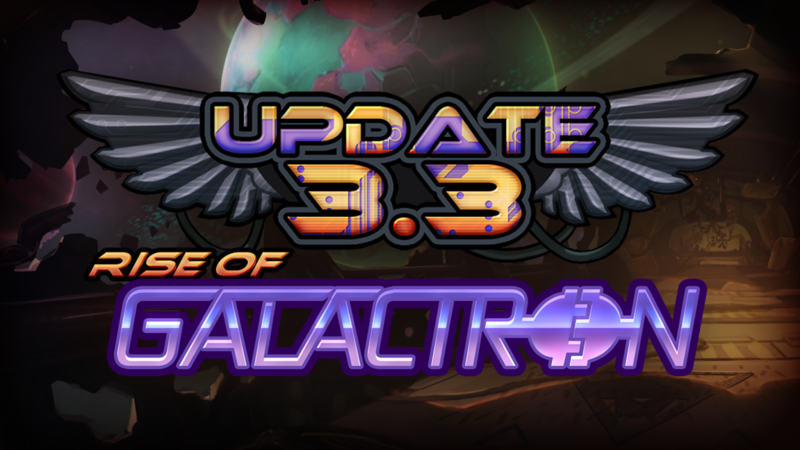 Everything gets better when you’re playing with friends, and we’re making it a lot easier to enjoy Awesomenauts with your BFFs when Awesomenauts 3.3: Rise of Galactron launches. We’re introducing a persistent party system where you’ll team up with your friends even before selecting which game mode to play and stay in a party when a match has concluded. Even if a player disconnects, they’ll reconnect to their party immediately when they get back. This makes several things a lot easier, including queueing for matchmade games, entering public custom games (or even private ones) together, and simply staying in the groove inbetween matches. And perhaps best of all: you’ll be able to chat with players who are in the same party as you are in your own private channel! You can invite players to a party by simply clicking on the empty slots in the top right corner of your screen. A party is limited to three players, and you can even enter local players into these slots if you want. Once you and your friends are ready to go, the party leader can decide to enter matchmaking or join a custom lobby. All players will be asked for confirmation whether they’re ready to enter matchmaking if this happens, and once everybody has confirmed they’re locked and loaded you will all be entered into the matchmaking system together. On top of all this, the way invitations are handled will be overhauled. If you get an invite to a custom game or a party, these will now show up directly in your interface. No need to open up the Steam overlay and locate the correct chat window – you’ll now have everything in one place! The persistent party will make it easier for you to invite your friends, and greatly improve on the current system that handles invitations. The persistent party system will be available in Awesomenauts 3.3: Rise of Galactron, but you’ll be able to test it out for yourself in the Open Beta that launches on July 20th. That means it’s only few more days until you can see all the improvements this update will bring for yourself! Early next week we’ll talk about the way the actual matchmaking system is being changed, so if you want to know more about that make sure to check back in!